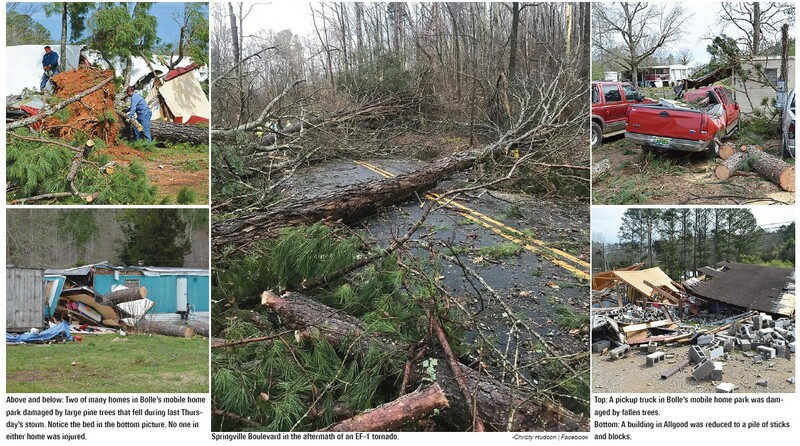 The storm front that came through Blount County late last Thursday afternoon brought with it high straight-line winds, thunder, lightning, and, in some places, hail, and two tornadoes that touched down, according to the National Weather Service in Birmingham. It also brought damage, destruction, and fear. The first tornado, as measured by the Enhanced Fujita Scale, was an EF-0, meaning it had winds from 65-85 mph. It touched down at about 5:04 p.m. and was on the ground for about 2.6 miles beginning near Tim King Road. It crossed County Highway 1 and entered Sand Valley lifting by Sawyer Mountain Road. The width of the damage was estimated at 115 yards. It lasted about five minutes. The NWS said most of the damage was downed trees, but one home did receive minor damage. The second and larger tornado, an EF-1, had estimated peak winds of 90 mph. It began at 5:07 p.m. and went over 4.5 miles before leaving the ground at 5:12 p.m. It was 600 yards wide. It started near Tidwell Hollow Road, crossed Lake Drive, crossed Ala 75 and Boat Landing Road, and ended near Woodard Drive per the NWS. After the storm subsided, emergency crews fanned out to assess damage. Officials found there were no deaths or even a single serious injury, despite significant damage to Bolle’s mobile home park on Ala 75 in Allgood. Wendy Rivera said she and her husband, Armando, were on the way home from Oneonta with their two daughters, Isabella and Bianca, when she got a tornado alert on her telephone. They saw the storm approaching and turned around. Their home was not damaged, but they found a utility pole and trees down around it the next morning. Tonya Starling, another resident in the community, rode the storm out alone because her husband was at work. Her home sustained some damage, but “nothing like some others did,” she said. Starling admitted to being scared and went to the emergency room with an elevated heart rate after the storm had passed. Just north of the mobile home community on Ala 75 in Allgood, there used to be a cinderblock building that Tori Smith said was rented by her employer, Golden Flake Snack Foods, to store product. The building is now a pile of rubble, but Smith was surprised that the surrounding structures had suffered hardly any damage. Green explained the meeting had been called in part to consider an emergency declaration resolution which, according to Blount County Emergency Management Agency Director Don Roybal, is a prerequisite for receiving financial assistance and reimbursement if a disaster is declared. Roybal reported that 32 homes had been damaged or destroyed by the storm. He went on to explain that after assessing the damage and speaking with his state EMA counterparts, he determined the storm that came through the county would not meet the minimum threshold of financial damage to qualify. “There is not going to be any reimbursement.” He later explained that each county has a financial minimum of damage it must meet to qualify for disaster relief, as does the state. He said he could not recall the county’s threshold at the time, but the state’s is $7 million, and the damage would not come close to meeting that mark. Because of that, Green said there was no need to put the resolution to a vote. Allgood Mayor Sandra Holland addressed the commission and thanked everyone involved for their help. She said the Red Cross and the Salvation Army have been giving residents and recovery personnel great assistance.